I recently went through the process of becoming a certified PADI open water diver. It is something I have wanted to do for a long time and finally decided to take the leap. Going through the certification process takes time and dedication. 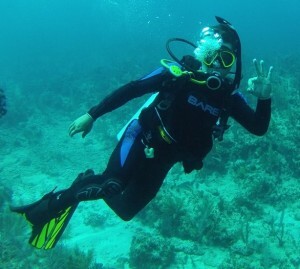 I first went through the PADI e-learning course. The online materials take you through everything from dive theory, to safety, to gear, to planning your dives. Along the way you take quizzes culminating in a final exam you must pass in order to proceed. Once you have completed the online course work, you then move onto pool training and then open water training in either a lake or ocean. Only when you have passed all course requirements and your instructor feels you are prepared, do you receive your certification. When I had a chance to think about it, this process is not all that different than the way we handle marketing research and planning. We spend a great deal of time educating ourselves in marketing philosophies and trends. We then research our client’s business, industry and competitors. Then, only when we have enough information do we create our plan. I was lucky enough to have my first post-certificaiton dives off the island of Ambergris Caye in Belize. This is one of the larges natural reefs in the world. On my first dive I was having some problems with my weight. I wasn’t carrying enough to allow me to descend into the water. There were a decent amount of waves which made it a bit more difficult to communicate with the dive master regarding my situation. For a moment I thought to myself, “What am I doing here?”. After a couple of minutes I was able to get more weight added and began my descent. During my first dive I started to have doubts about my abilities and overall comfort with SCUBA diving. Even though I had passed the entire certification process with flying colors, once being down 45′ in the Caribbean Sea I worried that I had made a mistake. How many times have we done this once we have launched a campaign? We did our research. We know our strategy is solid. The creatives knocked the execution out of the park. Yet, at that moment, we begin to wonder if we missed something. Did our target move? Do I know what I am doing? I hadn’t gone through all the time and training to give up now. I forced my mind to calm. I relaxed my breathing and went through my processes to remind myself of safety procedures. I found myself able to relax quite rapidly and begin to enjoy myself. After all, as long as I can breathe, I am fine. By the time the first dive had ended, I had experienced one of the most amazing events of my life. I had swam at the bottom of the ocean (all be it a shallow area) and witnessed a new beautiful world. If I had let my fears and doubts get the best of me, I would not have seen my dream through and been disappointed in myself and the experience. I have been a part of enough campaigns in my career to know that this same doubt and urge to change course is quite common. It is really important though to remember your preparation and allow your campaign to run and flourish. That doesn’t mean you should stick your head in the sand and ignore your campaign analytics, but don’t make any rash decisions just because you suddenly feel uncomfortable. In the end, if you have done your homework let your knowledge calm your emotions and just breathe. Previous story Lacking Professional Motivation?